This weekend, professor Donald L. Miller and students from his History of WWII course will be featured on CSPAN’s Lectures in History series discussing the Allied air war. The program will air 8 p.m. Saturday, Aug. 15 and 12 a.m. Sunday, Aug. 16 on CSPAN3. After it airs, it can be viewed in its entirety on CSPAN’s website. In March, a CSPAN production crew was on campus to film Miller and his class. The episode will feature class discussion and Miller’s comments on what daily life was like for U.S. and British airmen in World War II, the roles of each member of a flight crew, and how an airman’s experience differed from that of an infantrymen. 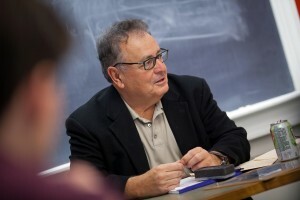 Professor Donald L. Miller teaches class in Ramer History House. Miller, John Henry McCracken Professor of History, is an award-winning author and expert on WWII. Three of his 10 books are on the war: Masters of the Air: America’s Bomber Boys Who Fought the Air War Against Nazi Germany (2006); D-Days in the Pacific (2005); and The Story of World War II (2001), all published by Simon & Schuster. He has been a consultant, writer, or on-camera expert on HBO’s WWII miniseries The Pacific and Band of Brothers, the 10-hour series WWII in HD that aired on the History Channel, and PBS American Experience documentaries The Bombing of Germany and Victory in the Pacific. Masters of the Air will be the primary source for HBO’s newest World War II miniseries, which is being produced by Tom Hanks and Steven Spielberg. As in many of his projects, students played a key role in the production of his books, including fact checking, proofreading, and critiquing Masters of the Air and The Story of World War II. Interesting AF airmen participation in WWII. Dr. Miller is a very valuable jewel in the Lafayette crown, and a worthy successor to the fine teaching traditions of the History Department faculty over the many decades. He brings important knowledge to his students, the many readers of his interesting books and the viewers of his tv programming. Bravo Professor Miller.